Long-time customer Keith thinks of CSR/Loan Assistant Val Leier and Personal Banker Rhonda Schlecht at the Medina location as family, coming in every day for coffee, cookies and conversation. He was so regular about his visits, that more than once, his “girls” went so far as to call his neighbors to check on him if he didn’t show up for a few days. Once, when Keith missed his medication and was having trouble breathing, he called the bank instead of 911! While Val kept him talking on one line, Rhonda called 911, and after some explanation of why the bank was making the call, got an ambulance dispatched to Keith’s home and they were able to stabilize his condition. Recently, Keith told Rhonda that he was going to the VA Hospital in Minneapolis for some surgery, so he would be gone for a few days, and not to worry. But, after a week or so had passed she called the VA to check on his condition. She found out that he had been transferred to the VA hospital in Fargo to recuperate. 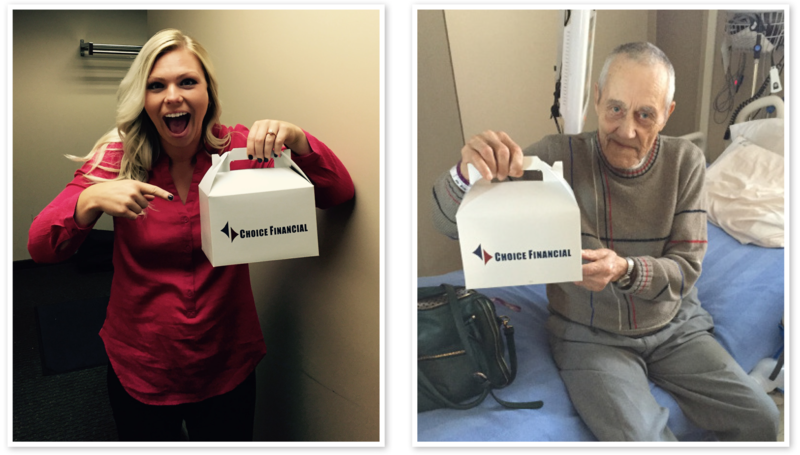 Rhonda and Val from our Medina location sprung to action when they heard Keith was in Fargo recuperating. When Rhonda told her teammates the news, they decided that they would surprise Keith with a delivery of some of the cookies he so enjoyed with his daily conversations. But they’d have to find someone in Fargo, near the VA Hospital to do it. Cally Colville, eBanking Specialist, was happy to make the delivery. Since the VA Hospital in Fargo was just a couple of blocks from her house Cally baked up a fresh variety pack of triple berry, white chocolate chip, and Reese’s cookies so she could personally deliver them to Keith after work that very evening. Keith was overwhelmed when he saw Cally pop in with her treats. She stayed for an hour or so visiting with him and listening to his stories. “I think he may have even appreciated someone to talk to more than the cookies!” she said.